The Korean crisis continues to grow. Washington and Pyongyang are not showing their desire to concede each other. The aggressive rhetoric of both countries keeps being threatening. Vice President Mike Pence says that “the strategic patience” of his country has come to an end and President Donald Trump is sending more US aircraft carriers to the shores of the Korean Peninsula. As a response, the North Korean Army continues testing ballistic missiles and preparing for nuclear weapon tests. The North Korean Permanent Representative to the United Nations Kim In Ryong claims that there is a possibility for a nuclear war which can happen at any moment. And only DPR Korea has nuclear weapon on the Peninsula. Tokyo estimates the current situation as the second level of danger which requires urgent military actions as well as the order to activate the Self-Defense Forces. At the same time, It is obvious that the government of militarist Shinzo Abe has a desire to check the Armed Forces of Country of the Rising Sun in real life, especially, when the adoption of laws in March changed its status. It may happen not on a battle field but in the atmosphere which is close to a battle. The actions of the Self-Defense Forces were restrained with number of restrictions which were connected with the defeat of Imperial Japan in the World War II. Article 9 of the Constitution restricted a lot the action of Ministry of Defense before, which is not directly connected with the defense of the country. Now, they have had the right to carry out an operation abroad in order to support allied forces, especially, the US Army. The Japanese military acts now as a part of the UN peacekeeping mission in the South Sudan and the fleet participates in an operation against Somalian pirates. Japan started creating the Marine Corps. It is attack troops which are used for offensive operations and for “the projection of force” that was not possible for the previous Self-Defense Forces. It is directly said in the National Defense Program Guideline that the Self-Defense Forces must be ready for “the attacks coming from enemy bases”. The government of Japan has been increasing the budget of Ministry of Defense during the last five years. Now, the budget is 5,1 trln yen (about 46,36 billion of dollars). Postwar Japan has not known this amount of costs so far. “Mid-term defense program for 2014-2018"; announced that the country abandoned theself-sufficiency principle in the field of defense. Now, Japan, whose military-industrial complex designed and produced all spectrum of arms for the Army, Military Air and Naval Forces, started purchasing arms abroad. Obviously, the US became the main arms importer. The purchase list consists of the fifth generation fighters F-35A (it is planned to purchase not less than 100 items), convertiplanes V-22 Osprey, planes of distant radar detection and management, cargo aircrafts, helicopters SH-60J, SH-60K and CH-47JA. Guided missile destroyers are equipped with American Aegis Combat System which is included in the missile defense system. The Naval Self-Defense Forces got a new helicopter carrier Kaga which is named after the Japanese aircraft carrier that participated in the attack on the American base Pearl Harbor in the World War II. Kaga as well as a helicopter carrier Izumo (displacement- 19,5 thousands of tons) are the biggest ships of the Japanese fleet. Each of them is capable to carry 14 multipurpose helicopters Sikorsky SH-60 Sea Hawk. It is obvious that the fleet is getting stronger to conduct military tasks in different parts of the planet. Now, the Japanese Navy consists of more than hundreds of helicopters carriers, destroyers, frigates, submarines, combat boats and auxiliary ships. The Navy is considered to have the fifth place in the range of combat power among the world military fleet. Japanese Air force consists of about 370 combat aircrafts. The Ground Self-Defense Forces includes 5 Armies with a number of 150 thousands of people. About 700 combat tanks, 750 armored vehicles and 1350 systems of artillery are used for arming. Rapid deployment forces (4 divisions and five brigades) are being created now too. The increase of Japanese military power is not counteraction towards the North Korea. The growth of powerful Chine (the longtime competitor of Japan) is going on in The Asia-Pacific region while the position of the US (the main ally of Japan) is getting weak. 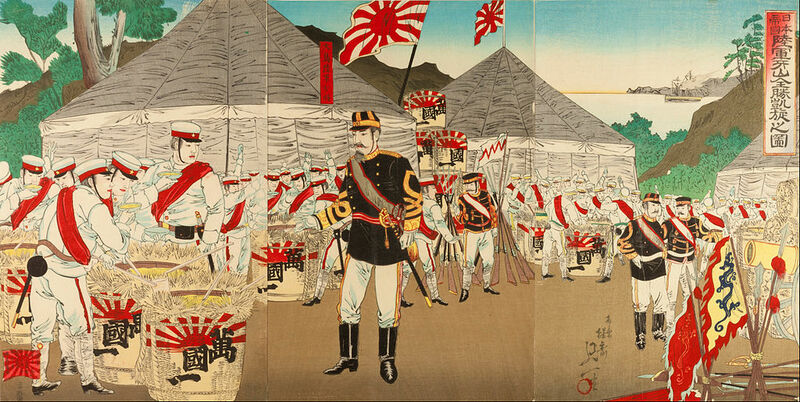 This situation makes the country of the Rising Sun to rely on its own forces in order to ensure the security. The military deployment of the Japanese Army along with the current Korean crises is a great opportunity for Tokyo to show Beijing the possibilities of the updated Self-Defense Forces. At the same time it will be difficult to blame Japan for provocations because Japan is not the reason of the crises, but, on the other hand, the country has a full right to take any measures in order to ensure the security.